← All Aboard to Europe with Avanti Destinations! On May 6, 1994, Eurostar’s channel tunnel, or “Chunnel” as it is colloquially known, officially opened from England to France. It is a modern marvel of engineering—it took eleven drilling machines and 13,000 people six years and 4.65 GBP billion to install it. At 31.34 miles long, it is the second longest undersea tunnel in the world. Its lowest depth is 250 feet underwater! Since it’s opening in 1994, millions of people have enjoyed the convenience and comfort of this fast zip from London to Paris. If it’s not on your travel bucket list, it should be! Tickets for the Chunnel are released about 6 months prior to travel date, and it can start as low as $65 if you grab yours early! They also have senior fares available. A regular one-way ticket may cost around $120-180. There are 3 classes on board: standard, comfort and business. Standard class is family-friendly, with access to a buffet car with snacks. Or if you’re traveling in comfort class, your journey will include a light snack and first class seats. Want to travel in style? Business class comes with a 3-course meal and your choice of fine spirit on board, plus access to the exclusive Eurostar lounges at St. Pancras or Gare du Nord stations. – A contest was held to determine where to place the Chunnel. – Both the British and French started digging from each side at the same time, but they didn’t quite meet in the middle—the English side tunneled the greater distance. – French engineer Albert Mathieu was the first engineer to propose the tunnel in the 19th century, and his plans included an artificial island half-way across for changing horses. – Much of the chalk marl bored on the English side was deposited at Lower Shakespeare Cliff in Kent, now home to the Samphire Hoe Country Park. – One of the eleven boring machines remains buried under the Channel. Another was sold on eBay for £39,999 in 2004. – Up to 400 trains pass through the tunnel each day, carrying an average of 50,000 passengers, 6,000 cars, 180 coaches and 54,000 tonnes of freight. – The lining of the tunnel is designed to last for 120 years. – Shuttle trains are 775 metres long – the same as eight football pitches. – The Queen and President Mitterrand were the honored guests on the inaugural ride. The royal party travelled from Waterloo to Calais at a sedate 80mph. The presidential party sped to the coast from Paris at 186mph. Willamette Intl Travel designs and books train itineraries all over the world. 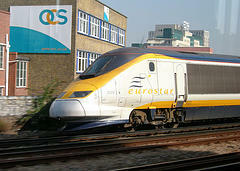 Our rail expects can explain the nuances of train travel and book Eurail tickets, rail passes and city passes. In a hurry? We can issue your tickets in-house with just a day’s notice! Make an appointment today, call 503-224-0180. Filed under England, Europe, France, Travel by Rail, Where in the World is the WIT Client?